Adding new siding to your home is a powerful update that can transform its exterior and help your home draw closer to reaching its full potential. But what type of siding will you choose? Most homeowners opt for common and traditional synthetic siding solutions that you can find at almost any hardware store. But at Custom Shingles, we specialize in premium cedar shake siding that makes the perfect fit for historic homes that need an exterior upgrade. Cedar siding delivers a wide range of benefits to style- and era-appropriate homes. And no roofing and siding specialists can do for your home what Custom Shingles can do with cedar shake siding. We have more than 35 years of experience in bringing custom wood solutions to owners of fine homes. We know this process inside and out and we can serve as both a source of expert guidance and flawless installation when you're ready to move forward with cedar shake siding. Read on to learn more about cedar siding shingles and how they benefit your home, as well as the many options you enjoy once you decide that cedar shake siding is right for you. If you want a free quote on cedar shake siding, or if you have any questions about the material or its installation, don’t hesitate to get in touch with us at any point. Custom cedar siding is siding that’s made out of the lightweight softwood known as cedar. Most homes use other, more traditional types of siding materials. But custom cedar shake siding offers a more elegant, refined and attractive solution — not to mention one that’s much more durable than traditional siding options. Cedar siding is also stained, both to create the exterior color you want and to treat the wood itself against the elements and the development of mildew, moss and mold. Cedar is traditional and reddish in color, but you can create the tint that you’ve always wanted by choosing a different type of stain. And, finally, custom shake siding can be cut differently to meet your exact needs and specifications. Specialty cedar siding is often layered just like shingles or shakes on a roof and the ends of the individual shakes or shingles can be cut for decoration. Some of the most common styles include sawtooth, half-round and fish-scale. See our examples of our decorative cedar siding shingles work in our portfolio (more on this in a moment) to get an idea of your options and to begin determining what’s going to work best at your home. Cedar siding offers several benefits for your home both functional and aesthetic. Perhaps the first thing that anyone notices about cedar siding is its beauty. Most of us tend to believe that the most common materials are the right materials — that goes for both roofing and siding. So when you see premium siding that looks fantastic — as cedar siding does — the impact is undeniable. 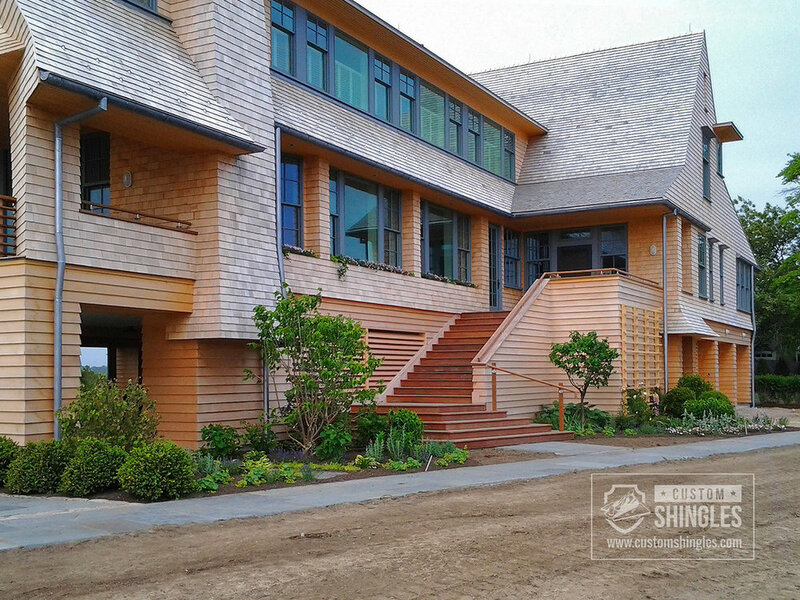 In addition to its beauty, cedar siding is also incredibly energy-efficient. Think of it this way: cedar is a soft wood of low density, which makes it both incredibly light and a powerful insulator. As a powerful insulator, the siding actually traps conditioned air and prevents it from leaving your home. While most traditional siding materials will let cool air escape in summer and hot air escape in winter, cedar’s insulating qualities prevent that air from escaping, which can help lower your heating and cooling bill. And, finally, cedar offers a unique blend of lightness, strength and durability. Cedar is easy to carry and easy to install given that it doesn’t weigh that much. But cedar’s light weight belies its strength. When you install cedar siding, you can rightfully expect decades of performance without wear and tear starting to show. For these reasons and others cedar is a premium and highly desirable material for roofing and siding. As attractive as cedar siding is, it's not a type of siding that you often encounter on homes. Most homes that have siding use fiber cement or similar synthetic materials. By using synthetic materials, you can add siding to a home completely and as inexpensively as possible. But there are huge trade-offs in choosing synthetic materials over a wood like cedar. First, you don’t get the beauty you get with cedar when you choose more traditional siding materials. Traditional siding is fairly basic, and homes with traditional siding tend to blend into their neighborhoods — there’s none of the head-turning attractiveness you get with cedar. Also, while cedar might be more expensive to install, it will pay for itself in durability. Quality cedar will last for decades and will greatly outlast more common siding materials. Yes — you can install synthetic materials more inexpensively, but you won’t get the same value. Finally, traditional siding isn’t nearly as energy efficient as cedar. As mentioned above, cedar’s qualities as an insulator help to lower your heating and cooling costs. More traditional siding materials will only offer a fraction of the benefit you get with cedar siding. When you're considering cedar siding, know that the same types of homes that lend themselves to cedar shingles on roofs are the same ones that will work well with cedar siding. For example: Nantucket-style homes, traditional and historic New England-style homes, coastal homes, etc. That's not to say other styles won't accommodate cedar siding well, but these are the styles where cedar siding will look more appropriate. Also, make sure your home is historic or at least employs historical building qualities when you choose cedar siding. It’s never a good idea to install cedar siding on just any home in the suburbs or on more modern homes built with more modern construction materials. No matter what you choose to do with your siding or roof, you want your upgrades to be era-appropriate. 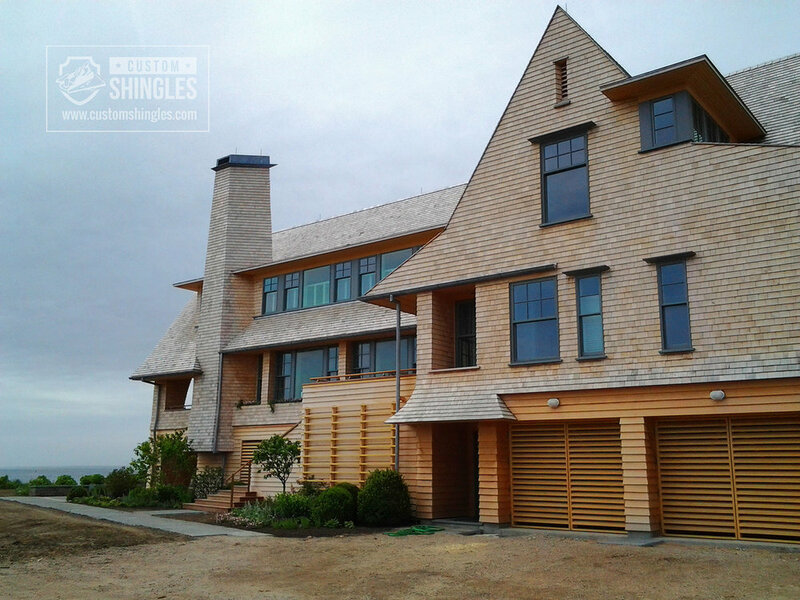 Always expect quality when you choose Custom Shingles as your provider of cedar siding. Since 1982, we've been serving homeowners with custom wood roofing and siding solutions — a service that's more art form than trade. What we're doing is using your home as a canvas onto which we can paint something beautiful. When the right home meets the right custom wood roofing or siding solution, the results are overwhelming. To make sure you get the type of results you want when you choose cedar siding, we provide free estimates before work begins, we provide design consultation, and we offer existing siding assessments, inspections and more. And once work begins, we take our responsibility seriously. We don’t see your home as just the next job. We see it as an opportunity to create something beautiful, and we do everything in our power to see that your cedar siding installation leads to the results you’ve always wanted. Also, if you need to replace historic cedar siding, Custom Shingles can provide support on those types of projects, too. We’re extremely proud of the work we’ve done with cedar installation through our 35-plus years of work. 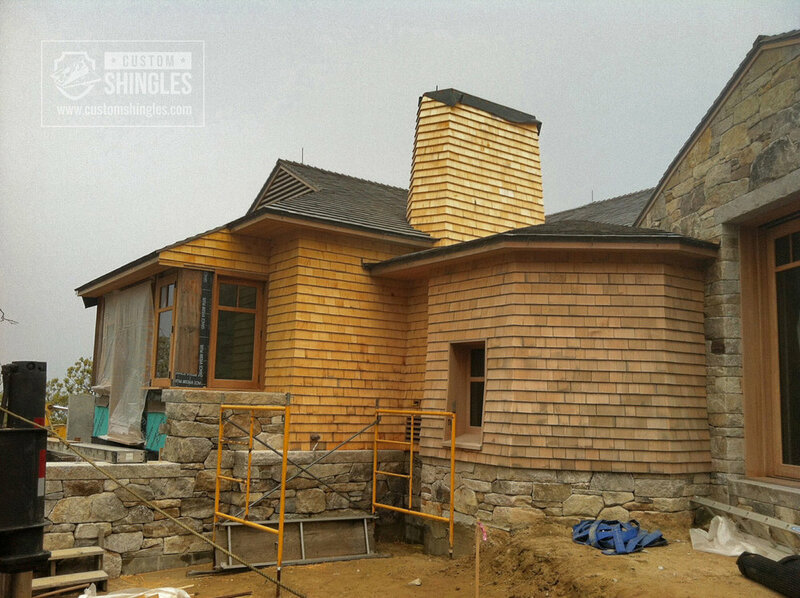 You can see many of our cedar shingle and shake installations, which include cedar siding installations, in our portfolio section. Just hover over the Portfolio tab and then select cedar shakes or cedar siding from the dropdown menu. We’ve found that a thorough portfolio section is often helpful in providing clients with guidance as they try to determine exactly what they want for their homes. You may see an image that makes you think you want the same exact styles of cedar siding for your property or you can use one of these images as a conversation starter — something that helps you better envision and articulate what you want to do for your home. Since 1982, we have been working with the owners of fine, historic homes to ensure they have access to the custom wood roof and siding solutions they need. We consider ourselves artists rather than just service providers. And what we do includes tools and resources that no one else in the country can offer. We are the premier provider of custom wood roofing and siding solutions because what we bring to each project simply can’t be replicated by others. Most of our clients who seek out cedar siding are taking care of beautiful and historic homes that just need the right additions and updates to reach their full potential. We pour all of our knowledge and experience into each project, providing the expert guidance and the outstanding service needed to see that each job results in something outstanding: a beautiful and historic home to be proud of. When you’re ready to take the next step with cedar siding, we make it easy. Just use the form below to request a free quote and we would be glad to discuss the quote and how to move forward with cedar siding for your home. To replace historic cedar shake siding, fill out the same form for a quote as well.